Python was created in 1991 using ABC language elements for the Amoeba distributed operating system. Today many sites are written in Python, with YouTube and Instagram among the most popular. As the language is widespread, updates and maintenance for Python websites are in high demand. The language got its title from Monty Python&apos;s Flying Circus, a British TV show popular in the 1970s. The creator of Python, Dutch developer Guido van Rossum, continues to play an active role in the development of the language. Updated versions are issued every two to three years. Python&apos;s syntax is minimalistic; its interpreter supports practically all platforms and operating systems. The language is used both as a main development language and in the development of new software prototypes. Sometimes Python is used for creating extensions and for application integration. A website for esoteric services enables experts to communicate with customers and provide services online via video chat. Subscribers can communicate with specialists in a public or private chat, receive written explanations, and exchange personal messages with consultants. Experts can create a video chat, view consultation statistics, review written services and entitlements, and access customer lists. The administrative interface enables administrators to manage mailouts, news and user information, and to view service statistics. Pay per acquisition (PPA or CPA) advertising network. The system is designed to be accessed by hundreds of advertisers and webmasters, and to constantly process thousands of user queries. Webmaster account: allows users to create and edit platforms. Webmasters can publish advertisements to every platform and obtain links and banners which can later be added to their site in order to advertise an offer. The advertiser obtains a reward as stated in the offer description for every click-through on the pixel or the link. Backend application which interacts with the database, processes queries from the frontend and queries for adding conversions. Development of a new version of the site. Banks save money using SMS notifications. The bank's clients are given a personal manager allowing them to check their account balance, savings and credit transactions in real time. The site has a conventional design, a smartphone version and a version adapted for HD resolution. 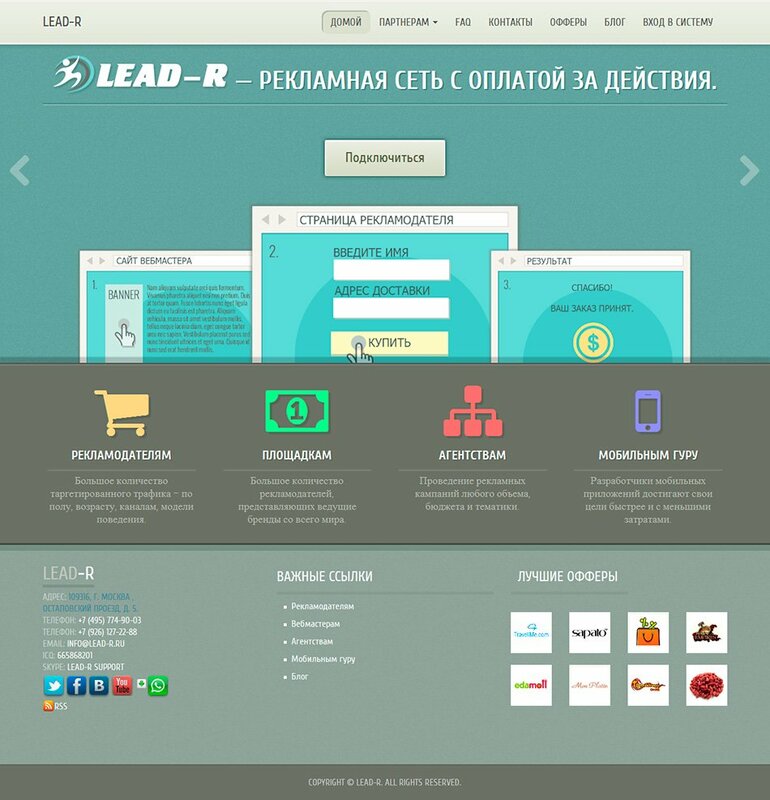 An English-language version of the site has been created for international promotion of the project. A performance audit was carried out on the site and the necessary corrections have been made. Search engine optimisation (SEO) has been conducted for the site using the IIS SEO Toolkit. The owners of the Chita city online portal wanted to rewrite the code entirely. We examined it and came to the conclusion that it would make more sense to correct the existing code. Our specialists transferred the website to a new server, updated the design, and added an events feed. User accounts for organisations have been expanded, registration through social networks has been added, ticket sale functionality has been debugged. Technical support and update for a service analysing around 200 online shops selling consumer electronics, household appliances, baby and toddler items, sporting equipment, building supplies, books, clothes, and jewellery. Among the outlets in the database are a number of major online shops, offering over 1,000,000 items. 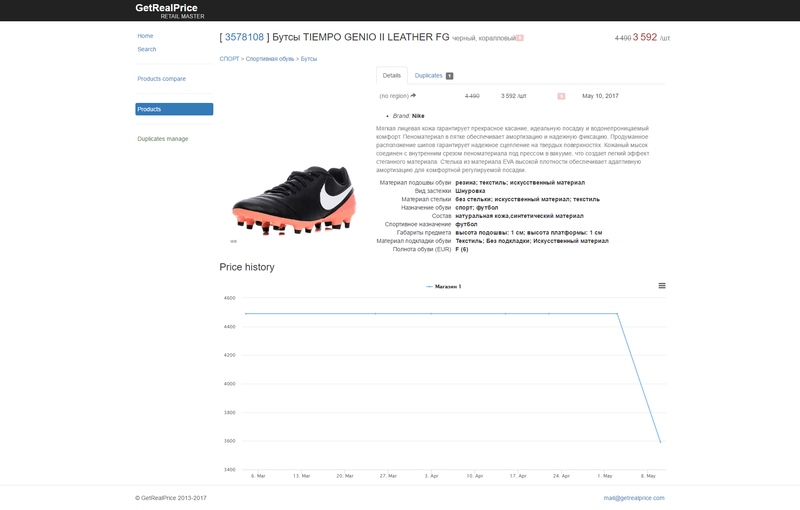 Comparison of goods from various sites is conducted automatically with the help of morphological analysis and also manually by moderators. When comparing prices, the currency and units of measurement are taken into consideration. 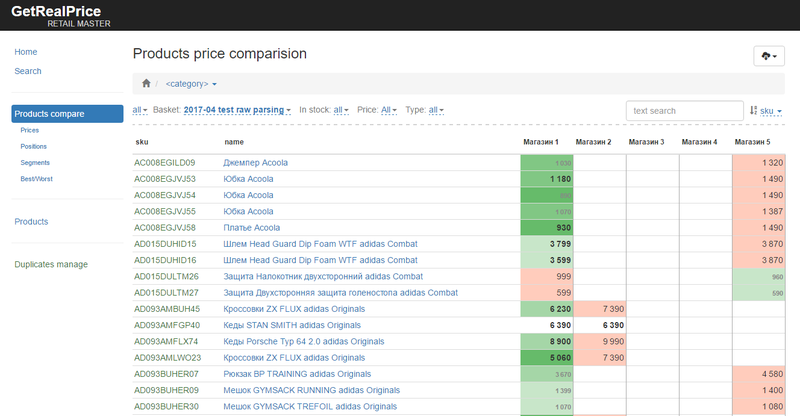 A comparative analysis of prices from the list of shops is shown as a series of graphs in the user account. 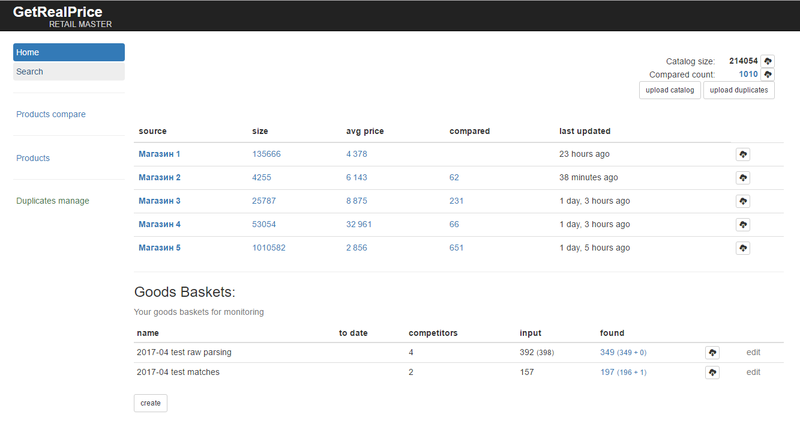 Users can also upload a basket of goods for which the prices of goods among competitors can be monitored. 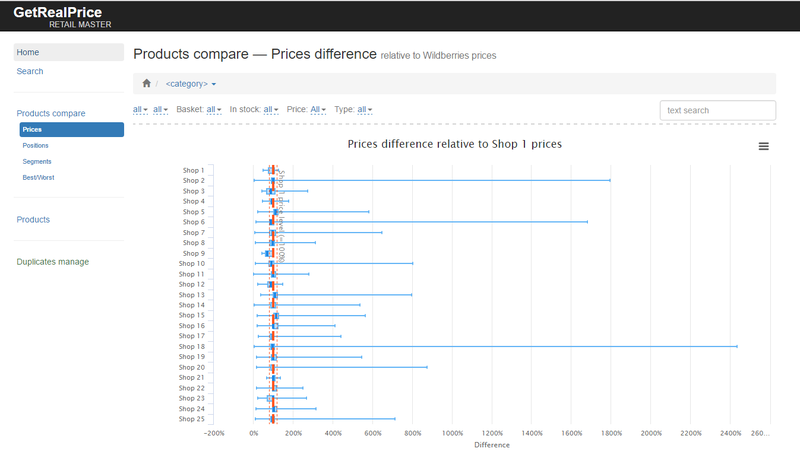 Price histories are saved for each item and are available in the form of a diagram on a product card. 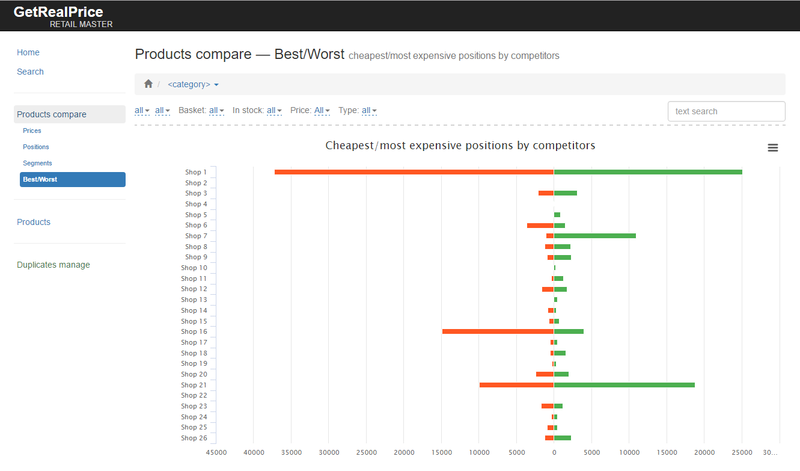 Price comparison results are presented in a table and standardised or specialised reports requested by customers can be produced in CSV, XLSX and XML formats.